OGS Notifier is a port of Dragon Notifier to OGS. 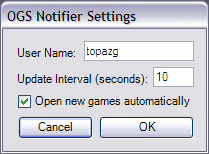 OGS Notifier is a utility for Go players. 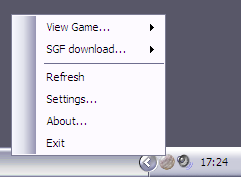 It sits in your windows tray bar and lets you know if there are any games on OGS where it is your turn to play. It is written in C# using the .NET platform. You can download the full source code and the executable at the project page on SourceForge. OGS Notifier is released under the GPL. You will need Microsoft's .NET Framework to run it.